Now you can remove the fat under your chin without liposuction! The latest injectable solution from the makers of Botox is Kybella. 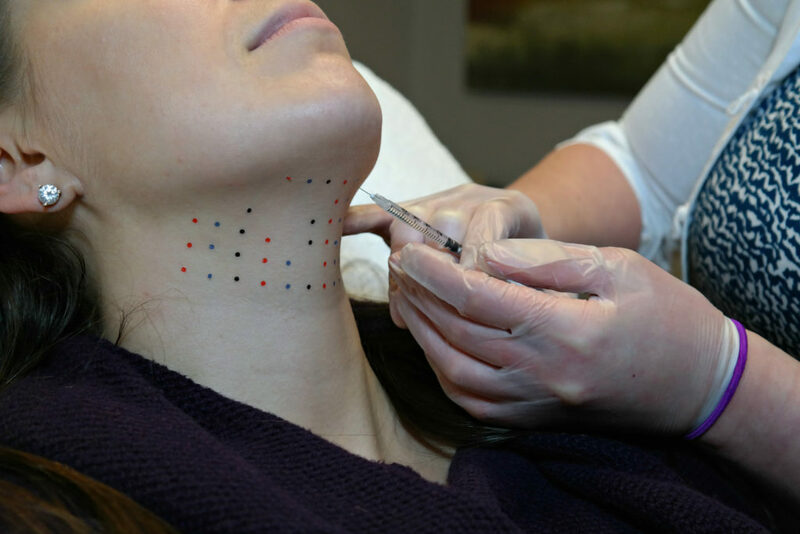 Specifically formulated as an injection to destroy fat cells, this is a permanent solution that allows our Denver skin care clients to see a more tightened chin line approximately one month after treatment. With just two to four treatments, with sessions spaced 1 to 2 months apart, Kybella can provide a permanent solution in reducing the appearance of a “double chin”. Kybella is a solution specifically formulated to be injected into the fat under the chin. The active ingredient, deoxycholic acid, assists in destroying fats cells which gives us a non-surgical option to remove fat under the chin with results similar to liposuction. Deoxycholic acid slowly destroys excess fat cells located under the chin. Depending upon how large the fat pad is will determine how many injection sessions are needed. Spaced approximately one to two months apart a series of 2-4 injection sessions may be required to achieve optimal results. Directly after the injection, the area feels tender and achy. You should expect swelling, tingling, possible bruising and even numbness in the area for up to one month. Redness and even areas of hardness in the treatment area are sometimes noted. We always recommend to our Denver clients that they should take 400 mg of ibuprofen one hour prior to the session along with using ice packs post-treatment to reduce inflammation and help with pain management. It will take approximately one month for the swelling to subside completely after Kybella injection, therefore at about the one month mark, you will start to notice more contoured jawline. Remember though, most people require at least two sessions to see results and up to four for optimal improvement. How long will results last from Kybella treatment? The active ingredient in Kybella, deoxycholic acid, causes the destruction of fat cells. Once destroyed, those cells cannot store or accumulate fat again. Therefore, results from Kybella are permanent. What happens if I were to gain weight after getting injected with Kybella? In the clinical trials leading to FDA approval, patients who received Kybella and then gained weight did not show the return of the double chin. Therefore, fluctuation in your weight will not produce a negative effect.